PLO leader Saeb Erekat says the organization would cut off contacts with the U.S. if its mission in Washington is closed. 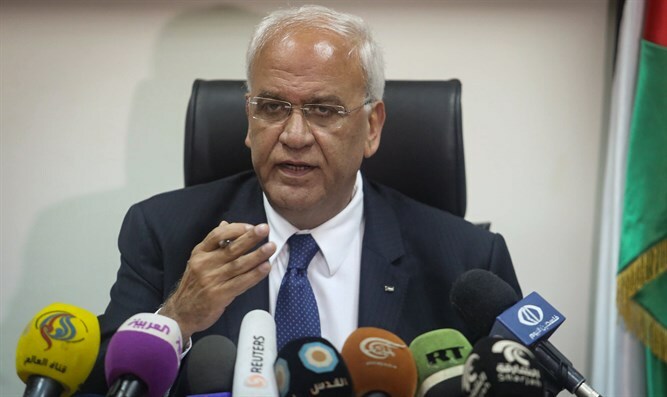 Saeb Erekat, the Secretary General of the Palestine Liberation Organization (PLO), said on Saturday that the PLO would cut off all its contacts with the United States if the Trump administration follows through with a threat to shut down the PLO mission in Washington, DC. “The State Department notified us in an official letter that they cannot certify the continued opening of the PLO office in Washington, DC, due to the fact that we are pursuing the ICC,” Erekat told Israeli public broadcaster Kan.
“We responded to them in an official letter that in case they officially close the office of the PLO in Washington, DC, we will put on hold all communications with this American administration,” he added. “This is very unfortunate and unacceptable. This is the pressure being exerted on this administration from the Netanyahu government. At a time when we’re trying to cooperate to achieve the ultimate deal, they take such steps which will undermine this process,” charged Erekat. His comments followed a report in the Associated Press which said that the Trump administration had put the PLO on notice that it will shutter their office in Washington unless they entered serious peace talks with Israel.